Skateboarding is everywhere. You see it on TV, in movies, on cereal boxes, the Internet, and around town. Skateboarding is popular with spectators and participants. Skaters and their fans come from all walks of life. They’re men and women, boys and girls. You might be a skateboarder, or you know a skateboarder. If you’re a teenager, the odds are good that you’ve stood on a skateboard within the last year, and you know lots of people that skate. 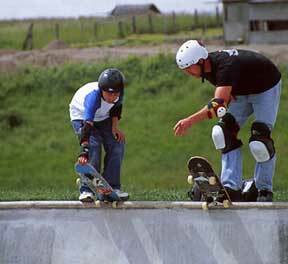 Many adults spent their youth skateboarding. The world’s most well-known skater, Tony Hawk, is a household name. There are millions of skateboarders in the United States and hundreds, if not thousands, of skateboarders in every city. People all over the world skate and there are skateparks to prove it—from Reykjavik to Kabul, from Cape Town to Tokyo. Even in the smallest towns and villages you can find a few local youth working on their skateboarding skills. Skateboarding is big and it’s here to stay. Where do all these people go to skate? It is surprising to learn that many cities and towns in the United States don’t have a single skatepark. It’s easy to find a basketball hoop or a baseball diamond almost anywhere you go. Yet when it comes to skateboarding, skaters have little choice but to ride on the sidewalks, on the streets, school campuses, parking lots, and other places around town… or simply don’t skate at all. They show an uncommon dedication to their sport. And what does this commitment to physical exercise and outdoor activity earn them? In many areas it gets them a big fine. When a community treats its skateboarders as pariahs, outcasts, and nuisances, they are telling skateboarding youth that they are not welcome there. They become someone else’s problem. “You are welcome to skate, just not here.” Skaters are routinely confronted and ticketed by police. Skaters see this as an unwinnable situation; they are passionate about skating but every attempt to find a place to skate inevitably leads to a confrontation with authority. After decades of this treatment, “illicit” street-skating has become an indelible part of the skateboarder’s experience. This is NOT because skateboarding culture has an anti-authoritarian tone, but because so many communities have systematically confined skateboarding that skaters treat each place to skate as a temporary situation until they are kicked out. For many, it is a daily ritual. Every experienced skateboarder can share a story of being treated like a criminal. What other sport can claim that? Advocates have been claiming for years that if your city doesn’t have a skatepark, your city IS a skatepark. Even where skating is tolerated, skaters put themselves at risk of being hit by vehicles. On average, nearly one skateboarder dies a week in the United States in an accident that involves a motor vehicle. (Skaters for Public Skateparks Casualty Report, 2011) An average skater recreates with constant reminders that most of the community doesn’t want them around, that they are at risk of getting a ticket, and that they can be hit by cars and other urban hazards. These are real problems that skatepark advocates like you are addressing, one skatepark at a time. 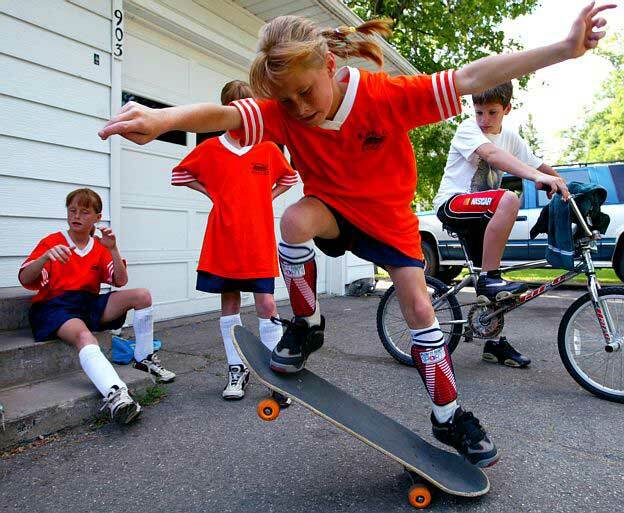 Skateboarding, for most young skateboarders, is a central part of who they are. It’s a shame to see a young person getting a ticket for doing kickflips (or even skating to the corner store), but the broader ramifications are far more diabolical. Skateboarders today celebrate their abilities to “get away with” recreation. Skateboarding means accepting the physical AND legal risks. The more effort is put into stopping it, the further underground skateboarding becomes. And the further underground skateboarding becomes, the more it is treated as a negative influence on local youth. When the topic of a skatepark finally comes up, it is met by a community that has lots of experience treating skateboarders as criminals or pests. Skatepark advocates, unlike those that champion other types of athletic facilities, start with a negative community perception. This means that every skatepark you see today is also the result of an advocate that started from behind the starting gate and overcame technical challenges AND cultural challenges. Public perception of skateboarders is often shaped by the most negative impressions. The reasonable truth is that most skateboarders are just ordinary kids. The situation in many cities is reflected in roving groups of skateboarding youth that a general public views as a pack of destructive, insolent teenagers. These communities are creating an “outsider” subculture in their youth. Later, they will complain that skateboarders are behaving outside the law, resulting in more heated confrontations and stiffer enforcement. In other words, the community tries to confine the skater to a narrow space and when the skater leaves that area in search of recreational opportunities, the community responds by drawing a smaller space around the skater. This is the unwinnable situation that most skaters are very familiar with. When pressed for less enforcement, anti-skateboarding grumps will flippantly accuse the skateboarders of wanting to skate “wherever and whenever they want.” This is as unfair as an accusation can get. Millions of skateboarders are being evicted from public places in their communities and when they protest, they are accused of unrealistic entitlements. This is the type of challenge you, the skatepark advocate, will become comfortable handling. Most skaters are so accustomed to being evicted from their favorite spots and being “talked to” by police that anti-skateboarding efforts made by the city are often as dismissed as easily as a “No Skateboarding” sign. In other words, the environment for skating is saturated with so many “NO” messages that they have become a routine part of skating. For many skateboarders, encounters with business owners, security staff, and police are a natural part of being a skateboarder. The bottom line is that skateboarders need a place to go. The act of riding on a piece of maple on wheels is not a destructive activity, and skateboarding “culture” does not promote antisocial behavior. Stiff enforcement of anti-skateboarding ordinances, which the skateboarders most certainly had no voice in shaping, has created a pressure cooker situation. Skateboarders need a skatepark, at least! This whole vicious cycle will be avoided by the work you are preparing to do. There are more towns with laws preventing skateboarding than there are skateparks. Balance is getting closer one skatepark at a time, but without more skatepark advocates, communities gravitate towards a “solution” that seeks to prevent the activity rather than direct it toward places where it’s appropriate. Creating laws that seek to prevent skateboarding is unimaginative and undermines the natural inclination of youth to be active, social, and engaged with their community. In other words, anti-skateboarding laws do exactly the opposite of what we claim are our community’s priorities. In spite of this, they are drafted and unanimously passed all the time. There are too few people speaking on behalf of skateboarders, and that is why people like you are so important. A skatepark allows skaters to form a positive, healthy community. A park is a gathering place for the community. A skatepark is a gathering place for the local skateboarders. Through the skatepark, the public sees skaters for what they are: brave, athletic youth with a passion for skateboarding. That’s all! The stereotypes that may have plagued skateboarders before the skatepark are quickly forgotten. There are over six-million skateboarders in the United States. Most of them are 24 years old or younger. (BoardTrac) According to the U.S. Census there are about 85-million people in the United States between the ages of 5 and 24. Therefore, 7.7% of youth in the nation have ridden a skateboard within the last year. (In the larger context, 2.1% of all Americans have ridden a skateboard this year.) That’s a huge number that cannot be ignored. Progress has been made by skatepark and skateboarding advocates. Behind every skatepark there is a group. Every group worked with their community and its leaders. Together, they raised awareness and effectively communicated the need to the broader public, and those communities responded. The skatepark was created and served as a model for other communities to follow. Many cities have long-range plans for community-wide networks of skateparks. They see the value of getting kids outside and active. There are over six-million skateboarders in the United States. Skatepark advocates like you are responsible for these success stories. Anyone whose life was improved by a skatepark can thank a skateboarding activist. This guide is designed to help the advocate turn his or her vision into something that can lead to a healthier community… to a new public skatepark. BELOW: An infamous video of skateboarders being admonished by local security personnel. This video reveals the kind of humiliating treatment many skateboarders receive from people in positions of authority. Most experienced skateboarders have a collection of personal stories about run-ins with the police. Most police claim that they do not enjoy kicking kids out of places, but disproportionately aggressive treatment is, unfortunately, quite common.